IBM 360/30 lost its memory? It appears the memory can be read, but it also looks like it is not being restored/written. 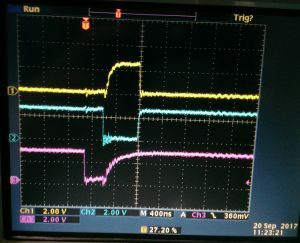 See how the Yellow trace and the Blue trace ~almost~ are high together? Well, IF they were both high together then the memory is supposed to write. Previous Previous post: It Verks, it Verks!